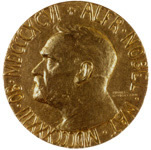 As a Nobel Peace Prize laureate, AFSC has the opportunity to nominate worthy individuals or groups for the nobel prize. Several AFSC nominees have won the prize, although often a few years after our nomination, including Martin Luther King Jr., Jimmy Carter, and Desmond Tutu. 1963 Martin Luther King Jr.